25 April 2017 - next dates for MRI scans covering Gloucestershire are: Wednesday 17 May and Thursday 15 June. 25 April 2017 - New digital wide bore MRI scanner will be used for more speed, and more space in the MRI scanner. MRI scan reporting service covering the Cotswolds in Gloucestershire and Oxfordshire, and from further afield including Warwickshire and Wiltshire. 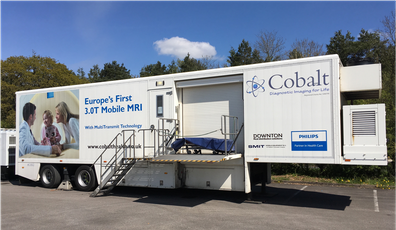 Mobile MRI scanner and images provided by Cobalt Health in Cheltenham. Radiology advice available for all healthcare professionals.